If you have spent much time looking at dolls, whether in the process of shopping as an adult or in the course of play during your own childhood, you will have noted the wide array of styles available–everything from very floppy baby dolls and rag dolls, completely unstuffed dolls, to very formed baby and child-like dolls. Aside from what you can see on the outside, though, it can be difficult to discern the real differences between dolls. Here are a few thoughts and tips to help you choose one for the child (or children) in your life. First, really look at the doll. Is it appealing? If your child will be spending much time with this plaything, it should be pleasing to look at. With dolls, there can be a tendency toward garishness or eerily happy facial expressions. 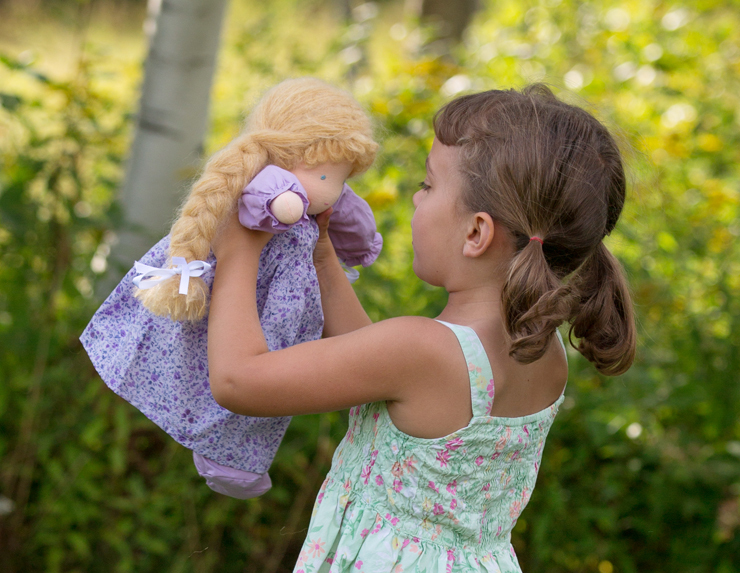 Milder expressions leave room for a child to choose what the doll is feeling. There are many adorable baby dolls, for example, that can only be sleepy or on the verge of tears, and this makes imagining something different for them more of a challenge. Take time when you’re choosing to think about how much you would want to look at the doll. 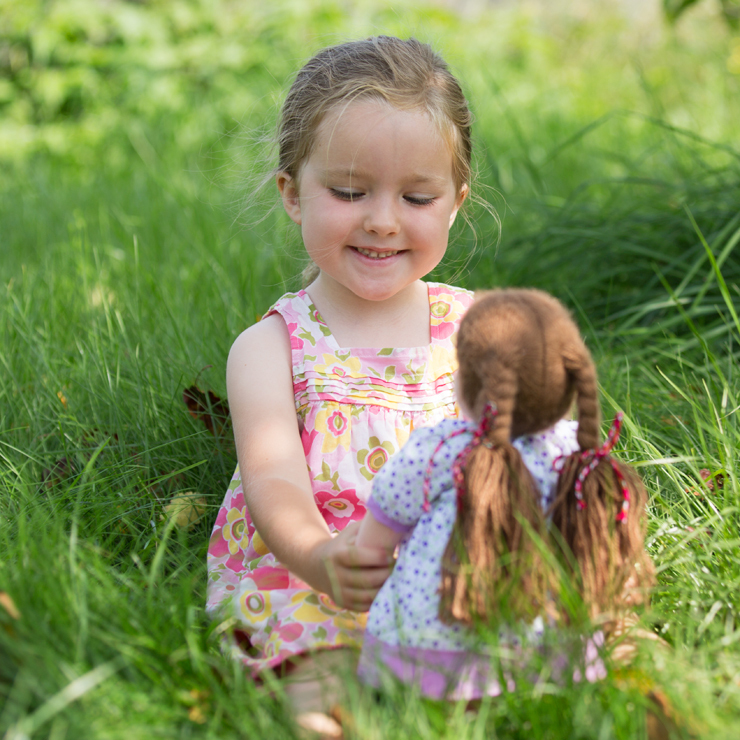 Dolls’ bodies can be really quite differently made, and there are some theories regarding what sort might meet children better at different ages. 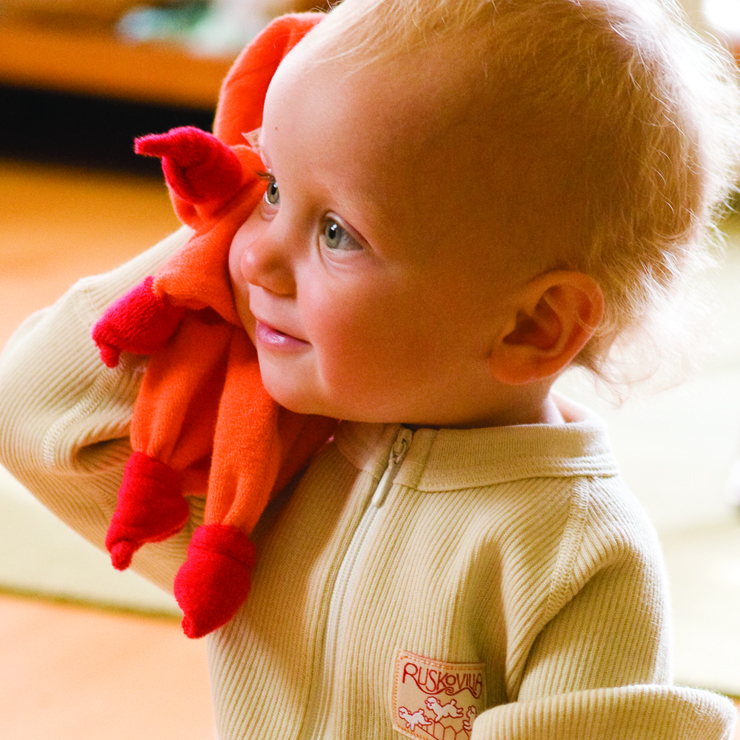 The unstuffed style works well for infants, because they are easy to grab and hold on to. The knotted hands this type of doll may have also offer a pleasing teething opportunity. A lightly stuffed doll with clothes that are part of the body can also be pleasing once a baby is more upright. If you are choosing a doll for a baby or young toddler, it is good to remember that the doll will most likely go in their mouth, so choose one that is safe to chew. Depending on the child, this style of doll can be pleasing on through toddlerhood, but by age three, most children are ready for a more formed type. For a two- to four-year-old, you might choose a doll with a simple, durable body and some clothes that are easy to manipulate. Children around this age show a widely varying interest in dolls; some are only interested in them as a puzzle that is solved once the clothes are off. Others are ready to tuck the doll in a sling and carry them everywhere, talking to them all through their play. But even the most devoted doll-tender will still be a bit rough on a doll at this age. A doll with arms and legs that are semi-jointed, or firmly attached, will better tolerate the vigorous handling. Fully jointed dolls require more careful handling, but they allow for posing, an activity that older children often prefer. They come in a range from those that seem more like babies to those that seem like children. A child can imagine a true Waldorf doll to be a range of ages, from little brother to big sister as its features leave more room for pretending. When choosing this sort of doll, think again of what your own child might most enjoy, where they are in their own development or even what is happening within the family (is a new sibling on the way, for example?). Also, these dolls usually have features that allow you to choose hair, eye, and skin tones that can look more or less like your child. Some children enjoy the idea of a doll who looks like them while others want a doll that is quite different. 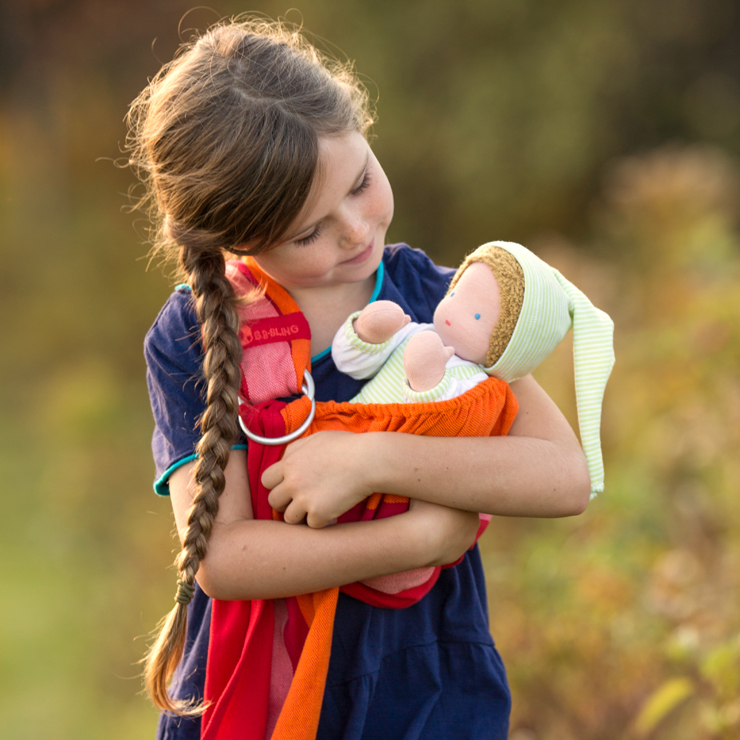 This is another time to reflect on what your own child would most prefer, because children often pour more love into their dolls at this point and seem to connect more with this other “person” than when they were younger. As you peruse all the choices available, try to keep your children and their ages in mind. Then, trust your instinct. After all, you are the best judge of what will appeal to your little one most. this is a lovely post! I would however, love to see more images of boys with dolls. 🙂 I have three boys, and they love dolls too- but have asked me why the photos they see usually have little girls, girl dolls with dresses, or lots of pinks. Hi- You are absolutely right! We have a bunch of pictures of boys with dolls, and we will update the post with some of them. I keep going back and forth and would love some input! Hi! First, I don’t think most children this age can be gentle enough for the joints on a truly jointed doll; they aren’t really fragile, but if you wrench on the arms and legs too much to dress and undress them, they will suffer for it. Another thing you might consider at his age is what you think he’ll do with the doll and how much he likes “work”. By this, I mean how much will he want to settle the doll in the sling? Would he enjoy handling a bigger doll? Some children really like the big movements necessary to deal with a doll like the big friend. Some prefer the ease of a smaller doll that they can easily pop into the sling. The big friend definitely fits in the sling, but I’m imagining the size of this doll relative to the size of a 20-month-old. He might also still be young enough to enjoy the cuddle doll or plush baby doll whose clothes are just part of the body; you cannot undress these dolls. 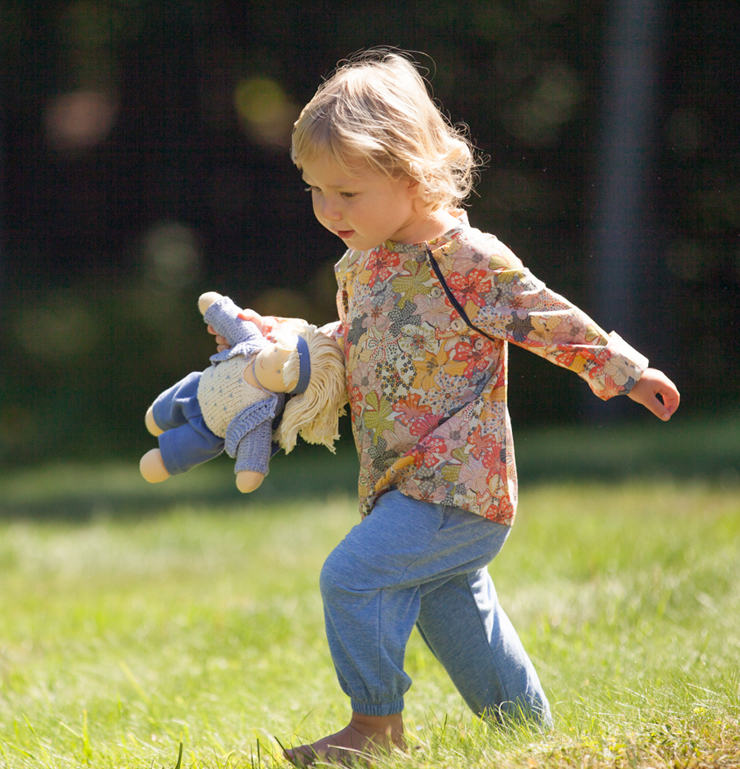 For a smaller, more rugged, but dressable doll, the little friend would be a good choice.